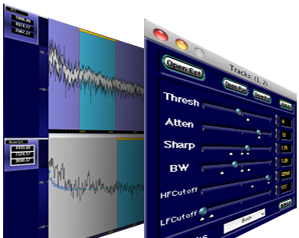 The Broadband DeNOISE II option is part of Sonic Studio's NoNOISE II restoration product line, and is an updated and improved version of the legendary restoration technology from Sonic Solutions. 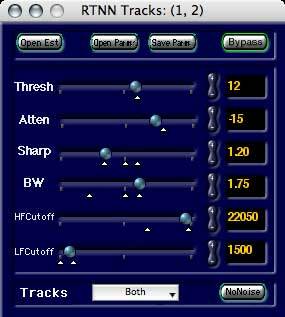 The Grammy® award winning NoNOISE technology set the standard by which all other restoration tool-sets are judged. Colorless suppression of excessive reverberation Manual DeClick II Native is a precise digital resynthesis technology unlike anything you've ever experienced. Manual DeClick II operates in the frequency domain, seamlessly repairing audio that you may have give-up for unsavable. Broadband DeNOISE II Native is the perfect add-on to soundBlade LE, SE and HD, and can be deployed as a real–time, foreground, user–directed mono, stereo or multi-channel tool. Broadband DeNOISE II is fully adjustable for detailed control of the restoration process, but can also run with default settings for cost–constrained, time–critical jobs or as a “black box,” real–time flow–through processor. Broadband DeNOISE II is must-have technology for any digital audio engineer that requires exacting detail and utmost workflow flexibility.